Despite mixing up with soccer royalties including David Beckham, Neymar, Zlatan Ibrahimovic, and being a constant face in the media, Nasser Al Khelaifi's married life is a source of gossip for many. The 44-year-old renowned business personality is listed among the top billionaires. Apart from being the CEO of beIN media Group, Nasser is also known as a former tennis player and the president of Qatar Tennis Federation along with the chairman of Qatar Investment Group. In 2013, Nasser was appointed as the chairman and CEO of beIN Media Group. His growing influence in the sport was recognized in 2015 and was crowned 'favorite Ligue 1 president’ in a poll conducted by France Football. In 2016, the French daily sports newspaper L'Équipe entitled him the 'Most powerful man in French football' in a 30-man list. Nasser Al-Khelaifi was into Tennis from his early age and carved out a career as a professional tennis player. During his tennis playing days, he was friend with the emir of Qatar, Sheikh Tamim, with both sharing a keen interest in tennis. As a tennis player, Nasser played two games in the ATP calendar and reached a career-high ranking of 995. His double's career was more successful and also represented Qatar in the Davis Cup. After ending his playing career, he moved into sports administration and has been president of the Qatar Tennis Federation since November 2008. What's more, he was chosen as the chairman of Qatar Sports Investment(QSI) in 2011. Shortly after being selected as the president, QSI bought the French football team, Paris Saint Germain(PSG). Under his stewardship, PSG has risen the ranks and are the most successful French side in this decade. You May Also Like: CBS Reporter Greg Gumbel, A Family Man With Wife; Cancer Victim? What's more, PSG has become a household name in the European football. As the president of PSG, the club has housed stellar names in the world of football including David Beckham, Zlatan Ibrahimovic, and lately Neymar and Kylian Mbappe. Moreover, in February 2012, he won a French 'Sports Business' award, receiving the most votes out of 1,500 and finishing ahead of nine people. The QSI he chairs is worth more than a 100 billion dollars, and beIN media is one of the most successful sports media houses in the middle east. All these have contributed to his net worth which is thought to be in billions. However, his time as the head of QSI has not been free of controversies. His team's spending has fallen foul of the financial fair play (FFP) in an investigation by UEFA. What's more, he was accused of gifting his Sardinian house worth $6 million as a bribe to FIFA secretary Jerome Valcke in exchange of world cup hosting rights for 2022, which was awarded to Qatar in controversial circumstances. Not just that, the Qatar native had his house searched by the investigators, and he was questioned in regards to the corruption scam. The PSG president is undoubtedly on point when it comes to talking business, and he prefers face to face talk rather than behind backs stabbing. This manner came into action all over again in September 2018 when Real Madrid tried its hands to land Neymar just a year on from his record transfer from Barcelona. We have a good relationship and they (Real Madrid) say they respect PSG, I hope that is true. That is some real professionalism out there. 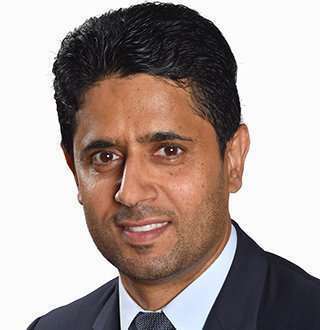 Is Nasser Al-Khelaifi’s Married? Wife Standby? Although his professional front remains open like an open book, the details of his love life remain mysterious. Because of his day job as the PSG chairman, he is regularly seen spending time with most prominent names in football which has intensified the search for his married life. However, he has been successful enough to hide his dating affairs out of the limelight. What's more, the absence of details about his wife or girlfriend has made him one of the most eligible bachelors in the world. The chairman of PSG is not into social media and has not been found sharing love affairs with a girlfriend nor delivered any suspicions regarding his married life and wife to the public. Discover: Ashley Olsen Pair Up With Old Dudes AKA Boyfriends, Married Or Still Dating? Judging by the revelations till this date, its evident that he is more focused and dedicated towards his career because of which the media also hasn’t been able to cover the dating aspect of his life. Until and unless Nasser decides to front the media and reveal himself about his wife and children; the rumor mills will continue spinning.